My name is Dave and I own a 1978 Trans Am. My friend and I designed up and had a small run of Freedom and Freedom II battery toppers made. We are currently selling the Freedom & Freedom 2 at Ames for $79.95. The black Freedom 2 will be available at Ames soon. For forum members we are offering the toppers for $70 plus $15 for shipping (full insurance is included). The item is shipped priority mail through USPS. I also included two pictures of the toppers. 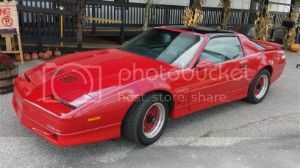 One of the toppers is in a Trans Am and the other picture is showing both toppers that are available. I hope everyone here likes the caps as much as I do. We spent almost 2 years gathering as much information as possible. If anyone is interested in these or would like to find out any additional information, you can contact me at correctrepo@gmail.com. Last edited by tz6p06; September 8th, 2018, 04:28 PM. Seems like a cool resto product. Good luck with it. Yes, looks good. Just a little too retro for my '88 I think. Though to be honest, the original was looooong gone when I bought my car. The black Freedom II topper will be available very soon. The decals are in process of being completed. I am hoping to have these available in the swap meet area at the Trans Am Nationals in a couple weeks. This topper fits a 78 series perfectly and will accommodate the smaller 75 series (there will be some overhang on the smaller battery). The inside dimensions of the topper are 10.5 x 7.25. Here is a sample of the topper, the decal isnt finished as I noticed some issues but it will look just like this. This battery was used from 1984 until 1991. I am hoping they will be available in the next couple of weeks. Looking good! The AC Delco battery in my bird is original to my purchase...so at least 5 years old. The need for replacement cannot be far off. The black Freedom II battery toppers are now available. Please let me know if anyone is interested. With the new cruising season starting, the toppers are available for a limited time for $65 plus $15 priority shipping in the Continental US with full insurance.